In the fertile Nile Delta, rising sea levels and a rising water table are already cutting into Egypt’s precious 4 percent of arable farmland. CAIRO — The heat feels relentless. Temperatures here in August regularly top 95 degrees Fahrenheit, and Sunday’s forecast projects thermometers will hit 100 F. In Ouargla, Algeria, the temperature spiked to 124.34 F on July 5 this year, the highest temperature reliably recorded on the continent of Africa. In 2016, Mitribah, Kuwait, reportedly reached 129.2 F, which could make it the highest temperature on record for the Eastern Hemisphere and Asia. With blisteringly hot summers becoming a regular occurrence, climate change could soon push an environment that is uncomfortable into one that is unsustainable — particularly for countries along the Arab Gulf and in North Africa. The past three years have been the hottest in Egypt since temperatures have been recorded, said Ashraf Zaki, representative of the Egyptian Meteorological Authority. In the fertile Nile Delta, rising sea levels and a rising water table are already cutting into Egypt’s precious 4 percent of arable farmland. In the worst affected areas off the Mediterranean, up to 6.25 to 12.5 miles from the shoreline have already become saline. “The main problem that most people are talking about is inundation by sea level rise for the Nile Delta. There is another problem: saltwater intrusion,” said Mohamed Abdrabo, director of Alexandria Research Center for Adaptation to Climate Change. To combat that, some coastal farmers are building up soil to raise their land and switching to salt-resistant crops like rice. “We are talking about billions of dollars in terms of losses due to saltwater intrusion,” said Abdrabo. In Alexandria, Egypt’s second largest city, about a quarter of the coast could be inundated if sea levels continue to rise, according to recent studies. “The problem with sea level rise and saltwater intrusion and most of the impacts of climate change you’re talking about in Egypt, it will be mostly gradual, which means you don’t feel it,” Abdrabo said. 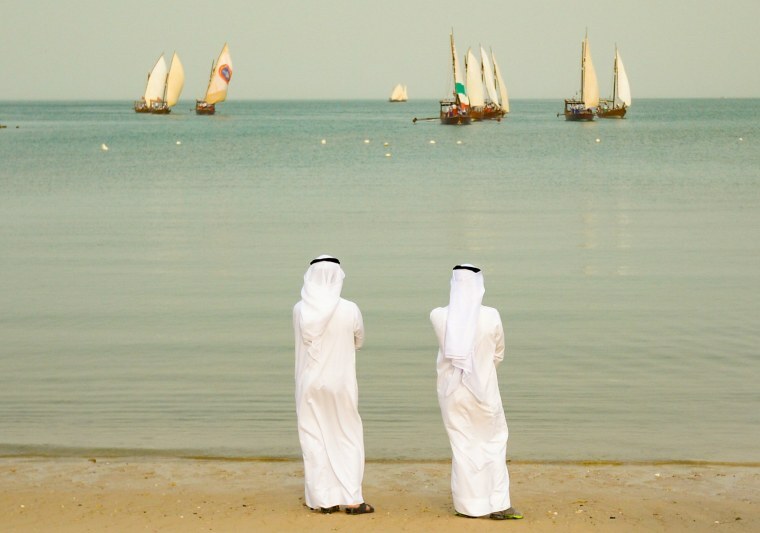 In the muggy Arabian Gulf — which includes the United Arab Emirates, Qatar, Saudi Arabia, Bahrain, Iran, Iraq, Kuwait and Oman — the immediate risk of soaring heat and humidity overshadows the distant threat of rising sea levels. An MIT research team determined that future temperatures there and in southwest Asia will exceed the threshold for human survival if nations fail to reign in emissions. According to an MIT video on the subject, “exposure to wet bulb temperatures above 35 C (95 F) is enough to cause the fittest to overheat and begin to fail.” Wet bulb temperature measures the combination of heat and humidity to determine how well the body can cool itself by sweating. Elfatih Eltahir, MIT professor of Hydrology and Climate and co-author of the paper, explained that they were able to measure how reducing emissions would decrease the number and severity of heat waves. In a nod to the gravity of the situation, the United Arab Emirates became the only Gulf country to establish a ministry dedicated to climate change that cuts across public and private sectors. The country launched a proactive plan guiding a transition to a green economy, cutting emissions, limiting risk and increasing adaptability to 2050. By that year, the country intends to double the contribution of clean energy to half of the total amount, reduce the carbon footprint by 70 percent and save $700 billion. Rising sea levels could eventually threaten 90 percent of infrastructure on the coast line in that country, but the immediate risk is the heat. In the UAE, all residences, no matter how remote, have access to a continuous energy supply for air conditioning. A green building code mandates energy efficiency, and district cooling systems that service areas rather than individual buildings has cut demand by half. As temperatures spike, comfort and even survival will hinge on air conditioning. The hope is that many of those cooling systems will be powered by renewable energy: Morocco and Egypt, for example, are developing the biggest wind farm in Africa, and Egypt is also developing the biggest solar farm in the world. He and other analysts believe every country should be doing more to avoid drastic consequences.